Gobble, Gobble... 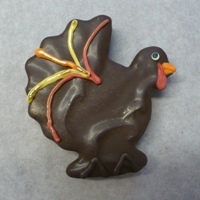 These chocolate turkeys are cut from our Simply Divine Brownie base, dipped in dark chocolate and hand decorated with a brush of autumn. Each turkey is wrapped in a cellophane bag and tied with a ribbon. Ingredients: Ingredients: Dark brown sugar, unsalted butter, fine chocolate (unsweetened and semisweet), eggs, enriched bleached flour, vanilla, kosher salt, baking powder, dark chocolate, assorted candy writers (sugar, palm kernel oil, cocoa, non-fat dry milk, dry whole milk, glyceryl lacto eaters of fatty acid, salt, artificial coloring), gold food luster.